In Chapter 1 I explained that the wicked warriors are small robots that automatically perform the task they were given — helping us to survive. They are the brilliant helpers needed to play the Phase 1 game. Now that we understand that the world is a neutral place and have stepped into Phase 2, it’s not necessary for our wicked warriors to be on a constant look out for danger anymore. However, they are still powerful assistants, so it would be a waste to let them become unemployed. So let’s give them a different role. Let’s reprogram them. Let’s turn them into merry minstrels. Instead of permanently being on the lookout for danger, let’s invite them to be on a constant look out for expressions of Love, such as people, objects and experiences to be grateful for. Our fear-based wicked warriors become the love-based merry minstrels if we reprogram them. They will still live in the outpost because they still need to function like an antenna. However they are no longer looking out for danger. And when you visit the outpost, they will no longer try to convince you that there is danger everywhere. Once we reprogram them, they will no longer collect evidence of the war-like behavior of others. They would be looking for people who have also chosen to live their lives from their center. Or, they will look for people who could use an infusion of love. They’re no longer looking for people to save, but people to support in a healthy way. That support may be a smile, a hug, or just to being present with someone from your center in order to inspire them to leave their outpost. They will no longer try to convince you of anything, but they will show you how neutral and harmless the world actually is. They no longer collect evidence of anything, but continue to show you what wonderful creations are possible on the game board of planet Earth. In this way you are also less likely to automatically go back to Phase 1. The more wicked warriors have been turned into merry minstrels, the less loud their call is when they perceive danger. As a consequence you won’t be overwhelmed by them. And it will be easier to stay in your center. How can you reprogram them? Actually, it is rather easy. Every time you are able to look at what is happening and stay out of Phase 1 a wicked warrior becomes a neutral robot. When you are able to turn the situation around and interact from Love, the neutral robot is turned into a merry minstrel. That’s how easy it is. However, in the beginning it may appear nothing is happening. It’s like losing a great deal of weight. When you want to lose 100 pounds, the visual loss of the first 10 pounds is almost invisible because there is still much left. It’s the same with the wicked warriors. Let’s assume that you have 100 wicked warriors. When you have turned one of them into a neutral robot or a merry minstrel then there are still 99 screaming wicked warriors left. It’s hard to notice the loss of one voice. So they will continue to make a lot of noise. However, after some time that will change when there are less wicked warriors and more merry minstrels. Then you will feel less stress and much more love and appreciation for life! What a fascinating approach to personal growth! Not only is this book fun to read, but it also gives you great insight on how you live your life, and what you need to do to move it forward. I trust you’re going to love it! In 'Life is a Game!' Jan Vermeiren has made accessible the most essential processes of mankind on Earth in a playful and easy-to-grasp way. And that with very contemporary analogies. We wish you lots of fun playing to become fully yourself! This is one of the best books I have read this year. 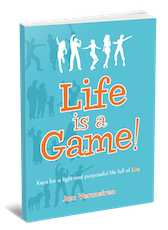 If you are serious about growing on a personal level ‘Life is a Game!’ is a must-read.